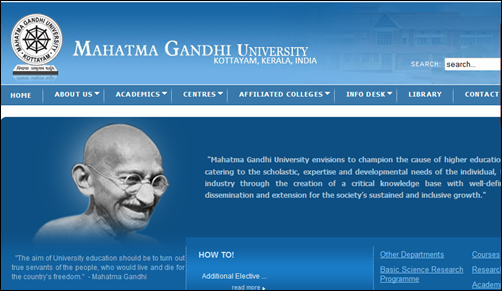 Mahatma Gandhi (MG) University is one of the reputed Universities in Kerala which had been the hub providing education to many people who could later boost off their achievements due to the fundamental support given during their college days. As like previous years, the University has invited applications for the admission of under graduate programmes in the affiliated Arts & Science Colleges / Constituent Colleges for the academic year 2014-15.This notification is applicable for all UG programmes except the Fine Arts and as the admission is based on entrance examinations. The 3 year Bachelor's Degree in the relevant subject is extended for a period of six semesters. The admission is purely made of the basis of the Centralized Allotment Process (CAP). As the allotment of a candidate to any college is based on the rank of the candidate and the availability of seats, this transparent system is well accepted by the populace. The admission to UG degree programme 2014 -15 is currently under process. Through asingle application form, students can apply foradmission to the U.G. Degree Programmes in various affiliated colleges. The application fee for general candidates is Rs 200 while for the SC/ST candidates it's Rs 100. While registering online, students have to follow the instructions and fill in the personal details in the relevant fields provided. The chalan which bears an 'Application number' can be used for all future online and offline operations. The Chalan print out should be submitted to the nearest SBT branch enlisted in the CAP portal and the required fee have to be remitted. After the final step, the application Number and password get activated. As the user page gets activated, the remaining personal details, academic eligibility and the options should be entered. While applying for the admission in the M G University it's very important to know the dates. The options for college(s) and programme(s) should be completed while submitting personal and academic data online within the last date of submission of application. After the allotment, candidates should have to remit the prescribed fee due to the University account by means of the designated branches of the State Bank of Travancore as per the time schedule arranged. As soon as the candidate remits the fee, the fee receipt should be produced for verification along with the print out of the allotment memo and original certificates at the college during the time of admission. The available seats from some of the undergraduate programmes are as follows: B. Com – 6,278; B.A. Economics – 1,941; B.A. English – 2,102; B.Sc. Zoology – 999; B.Sc. Botany – 975; BBA – 497; B.Sc. Chemistry – 1,354; BCA – 545; B.A Politics – 180; B.Sc Physics – 1,348; B.Sc. Maths – 1,574. Students can apply for the under graduate programmes offered by the Mahatma Gandhi University by visiting the official web portal.